On Aug. 25, as Houston and the rest of southeast Texas was preparing for Hurricane Harvey to make landfall, Rice students, faculty and staff were already brainstorming about how to help during and after the storm, which turned into one of the worst natural disasters in Texas history. 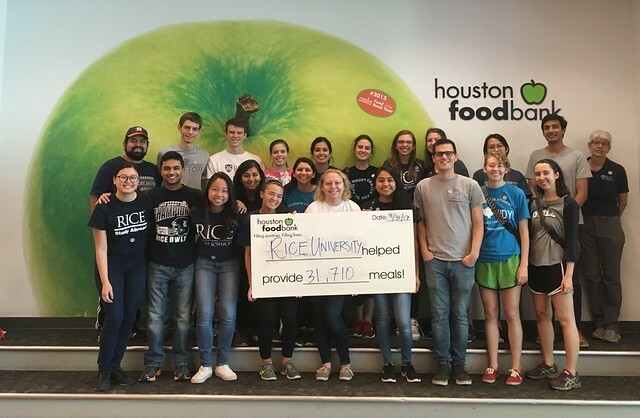 Rice students volunteer following Hurricane Harvey. Justin Onwenu, president of the Rice Student Association, said the response to Hurricane Harvey was multifaceted and focused on taking care of members of the Rice community, assisting those who remained on campus to keep things up and running during the storm and helping those in the Houston metropolitan area who would need aid following the storm. Rice’s Doerr Institute for New Leaders, Center for Civic Leadership, Student Association and Graduate Student Association collaborated quickly to create the Rice Harvey Action Team (R-HAT), an effort to match volunteers with specific community needs in the coming weeks and months. The effort came together as the storm was ending, and http://rhat.rice.edu was launched to make it easier for volunteers to sign up. Computer Science Professor Dan Wallach helped build a critical set of tools to support the effort. More than 1,700 students have signed up to help, in addition to faculty and staff who have volunteered their time. Caroline Quenemoen, associate dean of undergraduates and director of inquiry-based learning at Rice, oversees the Center for Civic Leadership. She said that in recent days, students, faculty and staff have been hyper-focused on “taking care of their own” – both members of the Rice community and fellow Houstonians. Tom Kolditz, director of the Doerr Institute, said the volunteer efforts allow students to get firsthand leadership experience in helping others recover from the storm. “We’ve been able to mobilize our volunteers in constructive ways, and are already having a positive impact on the Houston community,” he said. Onwenu said that thanks to the Rice needs assessment, a survey that was sent out to the Rice community Aug. 28 to gauge individuals’ storm damage and needs, R-HAT has been able to specifically target those in the Rice community impacted by the storm and provide support. Volunteers began working Aug. 30 at local shelters, including NRG Center and the George R. Brown Convention Center; the Houston Food Bank, where they packaged 31,710 meals in the first four hours of operation Aug. 31, and as part of demolition teams to help storm victims clear out damage to their residences and businesses. “The needs are constantly changing, and our volunteers are being extremely responsive to that,” she said. Hillary Nitsun, the administrative coordinator for Congregation Beth Yeshurun, one of the faith-based organizations that have been offering support for storm victims, was one of many community partners to thank the volunteers from Rice. And while Rice was closed Aug. 26 through Sept. 4, and initially a skeleton crew was keeping the university up and running and caring for students still on campus, students did their part. They worked to keep their residential colleges clean, helped with cooking duties in the serveries, took inventory of supplies on camps, unloaded supply trucks once they were able to make it to campus, assisted in staffing areas that remained open on campus and assessed the needs of Rice community members impacted by the storm. The students also collected toiletries and other supplies for employees who were stranded on campus, and for those in the community who would need them in the coming days and weeks. Students showed their deep appreciation for the Herculean efforts of the dedicated Rice staff who remained on campus by creating a large banner with personalized messages from students expressing their gratitude. Many residential colleges have also reached out to members of their college communities, including students and faculty, staff and community associates, to offer assistance to those in need. Edward Gao, a Jones College senior and one of many student volunteers, said that many of his friends began volunteering, which had a ripple effect and motivated others to go out and help. Evan Flack, a Duncan College senior, helped with house cleanup efforts in Houston’s Meyerland neighborhood and visited one of the local synagogues to do food preparation. Quenemoen said that this week’s efforts are the first week in what she knows will be a “long-term effort” by the Rice community to help rebuild Houston. She expects volunteer teams to move throughout the city and impact as many areas as possible. “I think this is just the beginning,” she said. Rice community members can sign up to volunteer for Hurricane Harvey relief efforts at http://rhat.rice.edu. Rice has also established the Hurricane Harvey Relief Fund, which will support Rice employees and students who have been negatively impacted by Hurricane Harvey and Rice outreach activities to benefit Houston in its recovery efforts. For more information or to donate, visit http://bit.ly/1rImdxE.